For decades, McLean Little League (MLL) has been giving kids the experience they remember for the rest of their lives. Families spend time together. Neighbors socialize. Communities unite. MLL is truly a family destination. The MLL Capital Campaign is 50% there! The Campaign has raised $244,000 and is in the process of completing the first phase of improvements. The MLL is in its second year of a Capital Campaign that contains facility improvements that address necessary repairs and updates to fields to ensure player safety and maximize field availability and player use. It will also help to create a reserve fund for future improvements. Funds have already been used to redesign batting cages, purchase new scoreboards, and enhance team gathering areas. WHY IS THE CAPITAL CAMPAIGN NECESSARY? As our player numbers increase and we wish to make more significant improvements, we need to grow the budget. MLL has over 1,250 boys and girls registered to play this Spring. The last capital campaign at MLL was 17 years ago. While the facility has served the program well, updates are needed and with that comes an opportunity. The MLL complex is truly a jewel thas has united the community every spring, summer and fall since 1965. The goals of the long term campaign are to create a safer, more accessible facility and improve player experience. The hope is to raise enough funds for necessary field and batting cage improvements, new scoreboards, enhanced team gathering areas, and an expanded and updated plaza space. WHERE WILL THE FUNDS COME FROM? We will be soliciting donations from local business and corporations. We are also asking our current MLL families and alumnae for contributions. For most kids, little league is the highest level of baseaball they will every play. With participation and support, the upgrades will provide for an expreince that keeps players coming back, year after year, and generation after generation. Teams will be asked to set a goal and reach 100% player participation. 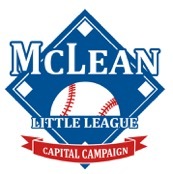 McLean Little League is a 501(c)(3) and all donations are tax deductible. Please consider supporting the campaign by clicking here. The safety and development of our players is paramount to MLL. That is why the continued support of our families is vital to our organization. Thank you for your support!